Sarracenia, the North American pitcher plant, is a favorite of carnivorous plant enthusiasts. From the durable Sarracenia purpurea to the colorful Sarracenia leucophylla, there are several varieties to keep you entertained, all fascinating, and all with very similar growing requirements. If you live in a warm, humid climate, you can plant Sarracenia outdoors in a boggy area. For most of us, Sarracenia will do best in containers so we can control the light, warmth and humidity. Fill a planting container with one part clean, coarse sand and three parts sphagnum moss. Avoid garden soil or commercial potting soil, as Sarracenia requires low-nutrient soil that will retain moisture. Replace the sphagnum moss every three years as it shrinks. Choose a planting container for the Sarracenia. Although any type of container with bottom drainage will work, plastic containers will retain moisture better than clay containers. Plant the Sarracenia in the container and put the Sarracenia where it will get a minimum of six to eight hours of direct sunlight every day. Natural sunlight is preferable, but if necessary, available light can be supplemented with a grow light or fluorescent light. Sarracenia plants also require warmth, with daytime temperatures between 70 and 75 degrees Fahrenheit. Place the container in a bowl or saucer with 2 to 3 inches of distilled water, and maintain the water level. Never allow Sarracenia to dry out. Avoid using tap water, as the chemicals in the water will harm the plant and, over time, can kill it. 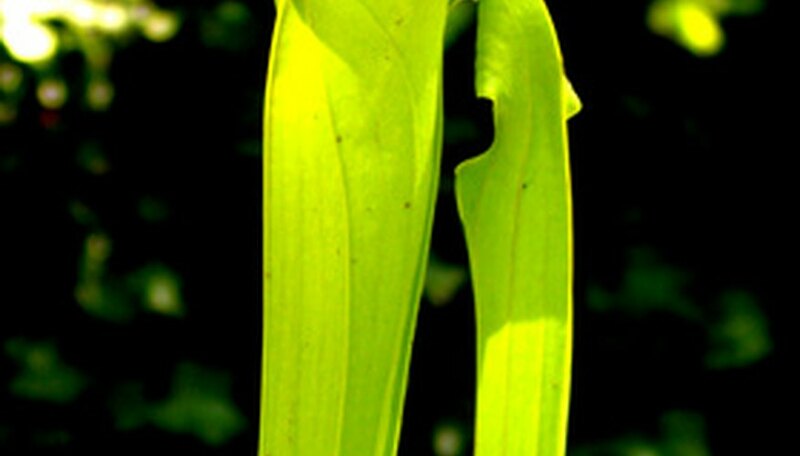 Rainwater and melted snow can also be used to water Sarracenia. Move the Sarracenia plant into a room with low light and cooler temperatures for the winter months, as Sarracenia requires a period of dormancy. Temperatures around 55 degrees Fahrenheit are best. Place the Sarracenia plant in a sunny spot outdoors during the warm weather so it can catch its own food. Otherwise, give the plant two or three small insects such as a fly or gnat every month. You can also feed Sarracenia blood worms, which can be purchased at pet stores. Don't give the Sarracenia chemical fertilizer, and never try to feed the plant with hamburger or other meat.